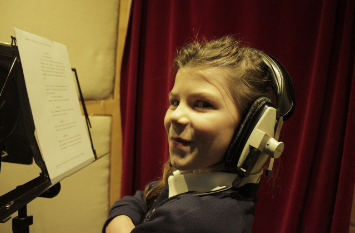 On Saturday 5th April, the final episode of Poppy’s Play Dates is made available on BBC CBeebies Radio. Every episode of this series has featured local children and their families as they join the character of Poppy in going on fun play date adventures. This weekend’s episode sees a Glastonbury family head to Swanage for a day at the seaside and caps off a wonderful series that has seen Poppy, voiced by local schoolgirl Ruby, and her friends visit a farm, attend a birthday party, go to Glastonbury Carnival and even watch a Yeovil Town football match. Having created this series and then co-wrote it with Stuart Packer, a fantastic storyteller who does spellbinding work in local schools, I am delighted with the end result and what we've achieved alongside our co-producer Dave Perry. We hope you enjoyed the series and everybody at Audio Factory would like to thank everybody involved with CBeebies for the opportunity to work on behalf of a national institution. We're so proud.